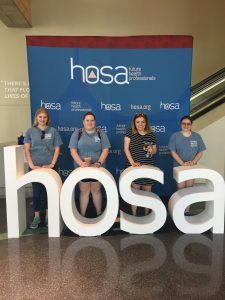 Four students represented Kearney School District and Missouri at HOSA’s 41st Annual International Leadership (ILC) Conference recently held in Dallas, Texas. Emily Bonner, Alysson Bussard, Erin Davis and Emily Michaelis participated in sessions that focus on health and biomedical professions. HOSA-Future Health Professionals is the largest international organization for middle school, high school, and postsecondary/collegiate students with an interest in such professions. While attending the conference, KSD’s Emily Michaelis received a $1,000.00 scholarship from Cengage Learning. 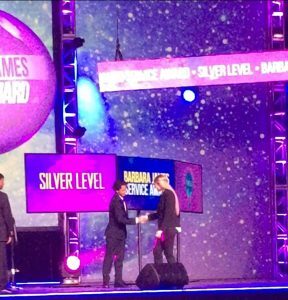 She also received the Barbara James Service Award with Silver Recognition which is given to students that have completed 175.0-249.9 hours of community service. Last year at the conference, KHS teacher Michelle Lawrence was honored as Missouri’s Chapter Advisor of the Year. HOSA-Future Health Professionals is a state and international organization for students interested in and preparing for a health careers. In Missouri, there are 94 chapters throughout the state with 3,725 members which include students, advisors, alumni, and professional members.